Most Rev. 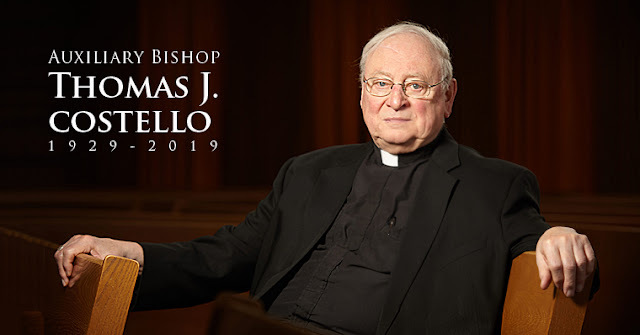 Thomas J. Costello, retired Auxiliary Bishop of the Diocese of Syracuse, died on Friday, February 15, 2019, at the age of 89 years old. Bishop Costello served the people of the diocese as a Roman Catholic priest for nearly 65 years as well as serving as the auxiliary bishop for over 40 years. A native of Camden, New York, Costello was the son of James and Ethel (Dupont) Costello. As an only child, he shared his vocation to the priesthood with his parents. His father’s response was, “If that is what you want to do, be a good one.” That was his father’s blessing and he lived up to that charge his entire life. He graduated from St. Aloysius Academy in Rome, New York before continuing his studies at Niagara University, St. Bernard’s Seminary in Rochester, Theological College in Washington, DC and Catholic University of America, School of Canon Law, in Washington, DC. He was ordained a priest on June 5, 1954, at the Cathedral of the Immaculate Conception by Most Rev. Walter A. Foery, D.D. He was appointed an assistant pastor of Our Lady of Lourdes in Syracuse where he served from 1954-1959. He served as a secretary in the Diocesan Tribunal for one year before being named superintendent of Catholic Schools from 1960-1975. In 1975, he was named pastor of Our Lady of Lourdes in Syracuse where he served until 1978. He was named vicar general of the diocese in 1978 and served in that role until 2009. Bishop Costello served on many boards in the community and across the country, including Jubilee Homes, Le Moyne College, the then Syracuse Interreligious Council, WCNY, Loretto and more. He was very active on the national scene, belonging to many committees of the United States Conference of Catholic Bishops, including time as chairman of the Communications Committee. Bishop Costello’s legacy will most notably be being a man of deep faith and a man of the people. He had no tolerance for any injustice. He was in the forefront of speaking against racism, poverty, inequality, violence and more. He marched in Selma, Alabama, with Dr. Martin Luther King, fought for employee rights, spoke against the death penalty, promoted the respect and dignity of all life, encouraged interfaith dialogue and equality for all. He very much believed that we are called to be peacemakers and he strived to live his life emulating that belief. Bishop Costello will also be remembered for being a passionate preacher with a booming voice and being the man to get things done in the diocese and the greater community. He was a scholar who was consistently approachable to all. He is survived by cousins, Sister Ruth Cecilia Dowd, CSJ, Sister Helene Daniel Courtney, CSJ, Sister Celine John Courtney, CSJ and Anne and John Scott of Texas; as well as very close friends whose company he thoroughly enjoyed. The Diocese of Syracuse is grateful for the tremendous care of Bishop Costello by St. Joseph’s Hospital, Loretto and Francis House. Reception of the body will take place on Thursday, February 21 at 4 p.m. in The Cathedral of the Immaculate Conception in Syracuse. Visitation will be from 4 to 7 p.m. at which time the vigil service will take place. A Mass of Christian Burial will be celebrated at 11 a.m. on Friday, February 22 at the Cathedral of the Immaculate Conception. Burial will follow at St. Peter’s Catholic Cemetery in Rome, New York. Contributions in his name can be made to the Light a Child’s Future Fund, which provides tuition aid to Catholic school students in the diocese.